FOIMan writes for PDP’s Freedom of Information Journal on the “ten things FOI requesters hate most” about the way public authorities handle their requests. Those of you working for public authorities – FOI Officers and others – work hard, I’m sure, to get FOI responses out as soon as possible. And no doubt you do your best to keep the customers satisfied. But we can always do more, and a bit of constructive feedback can help us to improve. But how do you get that feedback? Sometimes requesters ask for an internal review, but often they don’t. So we have to find other ways to get inside the minds of those who want to know more about our organisations. How? Well, what do most of us do these days when we’re annoyed with somebody? We Tweet about it, of course! I’ve saved you some time by trawling Twitter, WhatDoTheyKnow and other sources to identify the behaviours that cause our requesters the most annoyance. 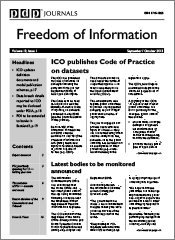 It’s completely unscientific, but you can read what I came up with in my latest piece for PDP’s Freedom of Information Journal. If you’re a subscriber, your copy of the journal should be landing on your doormat (or in your inbox) right about now. 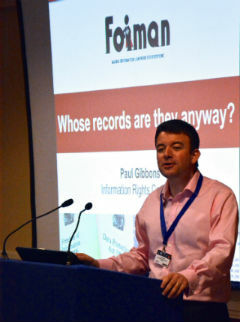 FOI Man makes the case for and against FOI and more transparency – what do you think? It’s very easy for an FOI Officer to find fault with FOI. But hopefully regular readers will have picked up by now that I support FOI and moves towards openness in the public sector. Unlike some, I don’t have any beef with particular groups who use FOI. Let’s look at the usual suspects. Of course businesses use it to draw up contact lists for marketing, or to build databases which they will then sell at profit. It’s their right, and those who promote FOI in Government think this is a “good thing”. It is a mechanism that allows information collected or created at public expense to stimulate the economy. It is a strong justification of FOI in a largely market-based economy. It is why Conservative, as much as Liberal Democrat and Labour supporters, feel able to support openness initiatives. Students use it to research their degree projects. So what? It’s good that they have the nous to use a facility such as FOI. We only have to provide what we have and if the cost is excessive we have an answer to that. 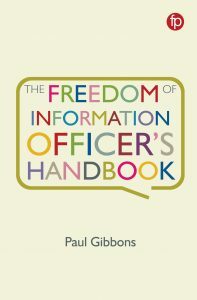 It’s frankly not true that, as some would have it, we have to do their work for them – if information is publicly available to them, we just have to point them in the right direction and if necessary cite the exemption for information that is otherwise accessible. It’s a good thing that journalists use FOI. I’d rather see stories based on evidence that I’ve helped provide than see badly researched sensationalism in the papers. Surely I’m not the only FOI Officer that gets a buzz when I see something I’ve provided mentioned in the Press? I sympathise with those who have become jaded because of the attitude of some (not all, or even most) journalists, and the way that some disclosures have been presented, but the answer is to remain positive and open, not to become defensive. Otherwise we just reinforce negative attitudes to the public sector in the media. Users of WhatDoTheyKnow are using a service to make requests. It’s marginally easier to make a request using it than sending an email. Some will abuse that ease, but that’s going to happen with any route made available. And by engaging with those who work for and with WDTK, we have an opportunity to encourage responsible behaviour amongst requesters. My point is that we can’t have a right and then quibble about who’s “allowed” to use it. And FOI is an important right. Whether we like it or not, it has become an internationally recognised badge of a free and democratic society. It’s as much about demonstrating our aspirations as a modern and progressive country as it is about accountability and transparency. This is one reason that I was disappointed by Tony Blair’s admittance in his autobiography that he considered FOI a mistake. If that’s true, that’s not only hindsight, but also short sight. That said, of course, it’s very easy for supporters and users of FOI to become blinkered. One of the vaguely articulated aims of this blog is to demonstrate the impact that the legislation, and people’s use of it, has on public authorities and the services that they provide. It is neither perfect nor pain-free. And maintaining it, somewhere down the line, means choosing between FOI and provision of other services. I’ve said previously that I am irritated by statements such as “it’s our information”. Aside from the fact that it is legally inaccurate, it is hopelessly impractical. Information is collected by public bodies so that they can provide the services that some or all of us rely on. Often, the provision of those services will be compatible with, and may even be served by, disclosure of the collected information to the public. But on occasion, it just isn’t possible, and it wouldn’t be in our interests (as a society) to do so. It’s not that I view Government as always benevolent and paternal, or take a view that we should accept what we’re given without question. But I do accept that at least some of the time, things work better without me or others knowing every last detail. If only because the physical means of disseminating that level of information will get in the way of the provision of essential services. If FOI and other transparency initiatives are going to work, they have to be managed as a process. That means, I’m afraid, refusing requests that will cost too much. Recognising that some people do abuse the privilege and turning them away. And using exemptions where we have concerns over the impact of disclosure of certain information. It means thinking carefully about the resource implications (I know, dirty words in the public sector at the moment) of more transparency. I think it also means looking at how transparency and FOI can contribute to the wider aims of the public sector. It has to be more obvious to public servants what the point of openness is, beyond satisfying curiosity. Can it help us make the savings expected of us? Are there ways that it can be built into our processes to make them more (and not less) effective? What are the wider benefits to our society? So what do you think? Do you have any ideas about the future of FOI and how it can be made to work better? I’m particularly interested in hearing your constructive comments on FOI and transparency (rather than the knee-jerk reactions that we’re all prone to when we feel very strongly about something). Let me know by commenting here, or via Twitter (@foimanuk). Just a quick post from me today to flag up an interesting Tribunal decision on vexatious requests (s.14 of the Act). The case is particularly interesting as both the Tribunal and the Commissioner are seen to support the use of the provision to defend against the FOI equivalent of ‘Denial of Service’ attacks. The decision is also entertaining in its descriptions of the lengths that the University concerned and the Information Commissioner went to to establish that a number of individuals were acting in concert.